The WAM Festival is back for 2016 and is once again packed with HUGE value showcasing opportunities for West Australian artists! Last year over 100 artists performed to over 10,000 punters and music industry delegates from all over the world, and this year it's all happening again from November 3 - 6. To be considered for a live performance opportunity please fill in the below form by 5pm on Friday 19 August and hopefully we'll see you at #WAMFEST 2016! - To be considered for the 2016 'Kiss My WAMi' compilation & digital playlists. - Only songs released between 1 October 2015 and the start of the Festival will be considered. Unreleased material is fine if the release is scheduled before November. * 8. Are you a WAM member? * 9. 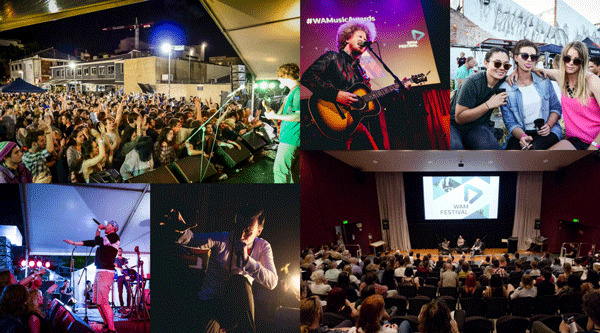 Are you planning on attending WAMCON 2016 (The WA Music Conference) on 4-5 November? * 10. If you answered "yes" to Q.10 - what topics would you like to see discussed or addressed at WAMCON? Are there any local, national, or international speakers you’d like to see present? * 11. If you answered "no" to Q.10 - is there a reason why? Your feedback will help us improve the quality and increase the appeal of WAMCON.